A day late on this wrap up because of the holiday weekend and my inability to sit down at a computer for more than 10 consecutive minutes. It's hard to find a lot of things of real substance to discuss in a game when Michigan's punt unit was, literally, never on the field. But it's safe to say that of all of the football-related things that happened on Saturday...basically, all of them were quite good. Its hard not to put more stock than you should in a game like this. I've watched Michigan struggle to beat teams like Hawaii in years passed. I seen Michigan lose to teams like Hawaii in years passed. So a 60-point win against a real-life opponent isn't something I'm used to. In this so-called "layup" of a game, Michigan did all of those little things well that you want them to do in a season opener. No bone-headed mistakes (other than Speight's INT), the defense was on lock-down with great coverage and superb tackling, the running and passing game looked solid. I mean, really, what else is there besides analyzing the look of the new helmets? "You're gonna need that helmet." I swear the longer you watch this the faster he gets. The scoreboard, yes. Hanging a 60-point win on anyone feels good. If for no other reason than its exactly what you're supposed to do to an opponent basically traveled 6,000 miles for a paycheck. Speight. Wilton Speight did pretty much everything right after his opening play INT which is exactly what the home crowd was not wanting to see from a brand new QB. Wilton pulled it together though for a solid opening performance. Running game. True freshman Chris Evans will get all of the ink (as he should) but I thought the entire running game was worth writing home about. The line blocked great, every back ran tough and with purpose, Smith looked good and Ty Isaac looked improved...nothing wrong with that. Linebackers. A lot of speculation before the season that the linebackers would be the big question mark on defense. The season is barely off the ground but you have to be encouraged with how well Mike McCray (B1G defensive POTW), Jabrill Peppers and Ben Gedeon looked out there on Saturday. Those 3 led the team in tackles which was huge. Goats. I have to admit, I was a little star struck with His Airness. Not very often do you get to see a living legend in person like this. 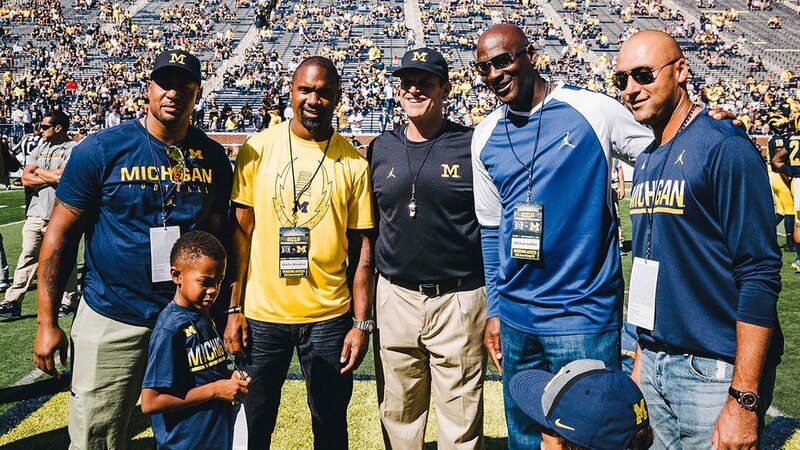 Add in Derek Jeter, Charles Woodson and (ahem) LaMarr Woodley...not a bad look for potential recruits. None...NONE of this happens without Jim Hackett, btw. His ovation on Saturday was both well earned and hopefully not the last. Jumpman. The new uniforms complete with matte satin helmets looked very sharp. I watched the replay of the game on Sunday morning and have to say the helmets looked better on TV than in person. Nike makes a well put-together look and Michigan just seems like a natural with the swoosh jumpman. 110,222. Let's not let it go unmentioned that the fans, students included, showed up on time and ready to go. The student section was both maize-colored and FULL by kickoff...a noon kickoff no less, which is a sight to behold after some of the years we've seen...even for openers. Also, the crowd's coordination on "McDOOOOOOM" must be commended. This is going to be a thing now. Injuries. In a game like this, really the worst thing is injuries. Michigan had a few guys held out for precautionary reasons...Hurst, Lewis and Braden. De'Veon Smith left with bruised ribs but is expected to be fine. But the injuries sustained by Bryan Mone and Taco Charlton sound like they could linger for at least a few weeks. Here's to hoping Mone gets back soon. [Update] The Wolverine's Chris Balas tweeted out Tuesday morning that Taco was spotted on campus without crutches and walking normally. Awful announcing. ESPN's color analyst Ed Cunningham speculated on the fly (usually not advised) that the reason for Jourdan Lewis was dressed but not seeing the field was due to a disciplinary action. 9/10 that's probably the case, but definitely not for Jourdan. Harbaugh mentioned in his Monday presser that Cunningham had "got a little ahead of his skis" with that comment...which is true and now a turn of phrase I will be incorporating into my daily repertoire. The true freshman gained 112 yards and 2 TDs on only 8 carries and did so looking about as effortless as anyone I've seen running the ball for Michigan since, well, probably Denard Robinson. He's not a bruiser like De'Veon Smith, but his field vision and cutting ability allow him to not have to be. The senior from Trotwood, OH brought home 9 tackles, 6 solo, 2 sacks, 3.5 tackles for loss and a forced fumble. Not bad for his first career start at LB. He's going to get a lot of game balls this year, but his first was earned on special teams. Punt returns alone...most of which were fair caught but still including the hyper jump on the return that was called back, were enough this week. Jabrill is a threat and most teams will eventually learn not to ever kick to. This game ball is earned also thanks in large part due to the fact that Michigan didn't punt, never attempted a field goal and kicked off through the endzone a bunch of times. I figured his impact would be felt quickly, but damn. The A-gaps for Hawaii's offensive line were NSFW. Neither was their first half offensive stat sheet with was mostly in the negative until their final drive...I don't think they got a first down until well into the 2nd quarter. They say Brown is a blitzing guru, which I would have agree with after game 1 at Michigan. 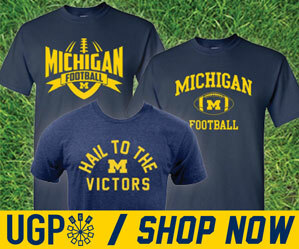 Also receiving votes: Wilton Speight, Mason Cole, Delano Hill, Tim Drevno, Ben Gedeon. First games are about learning something. Michigan learned a lot from last year's away mission to Salt Lake City, it bounced back because it worked on correcting mistakes that cost them a victory. All of the preseason expectations change as we gather data points. Is Colorado better than advertised, or is Colorado State really bad? Could Wisconsin be more of a challenge than anticipated? Is the defense for real? These are the storylines, some will be answered, others will be forgotten as the season moves forward. Here's to hoping that we will never have to say "Dammit Jim." But the more Evans ran, the more it dawned on me – he was the 3rd running back to carry the ball for the Maize and Blue against Hawaii. 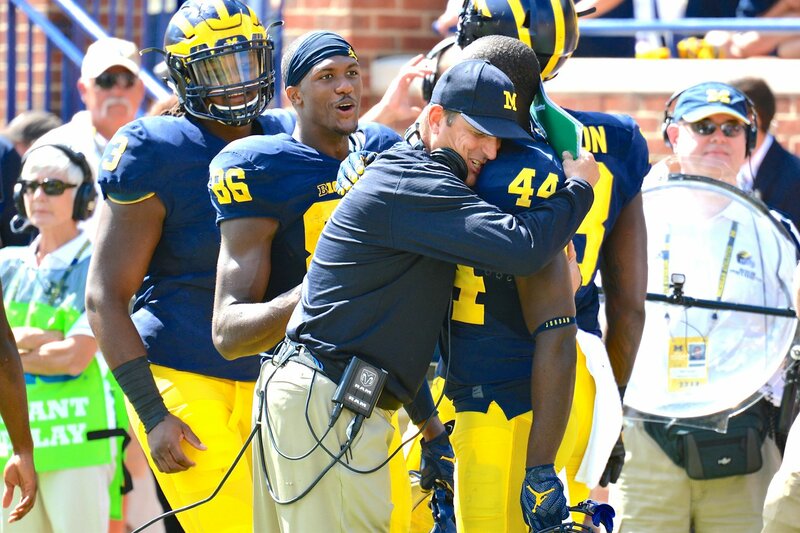 And just like that I realized that Michigan now has Alabama depth – in year two of Harbaugh. No, Evans does not equal Jamie Morris. Evans = T.J. Yeldon. Remember when ‘Bama had Eddie Lacy, Blake Sims and Yeldon was the 3rd-string RB as a freshman? That’s where Michigan is at right now with their offensive backfield. Deal with it, Paul Finebaum! I love the opener. Everything about it. You really don’t need to have Jordans, Jeters and flyovers or even a great opponent to make it special. You just need decent weather (it was perfect) and a nice win (it was near perfect). I mean, the students showed up on time. Let us consider the situation. It is noon. Michigan is playing Hawaii, a 42-point underdog. The sun is unfettered in the sky, at maximum hangover-beatdown wattage. It is Welcome Week. And despite being the same age as Will Smith's kids, the students are in their section at kickoff.